French Guiana, or Guyane Francaise, is one of several colonial Guianas of South America. British Guiana is now known as Guyana, Dutch Guiana is now Suriname and the Spanish and Portuguese Guianas are now part of Venezuela and Brazil respectively. 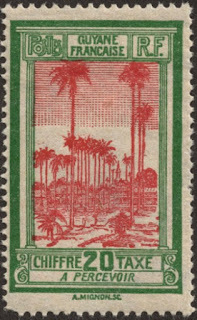 A percevoir stamps are postage due, but also any French colonial territory that didn't have their own stamps were issued with these special a percevoir stamps. I'm not exactly sure what chiffre taxe means. Here we have a 20 centime green border and rose Royal Palms engraved by Abel Mignon. His first stamp was issued in 1925 when he was already 63 years old. He engraved stamps for France and several of her colonies from 1925 to 1933. He died in 1936. This stamp is from 1929. I especially like the varying heights of the palm trees. well, that and the colours chosen. 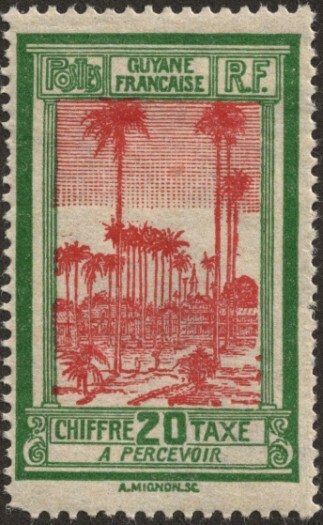 At first sight the stamp made me think of Suriname, and it is good to learn that it is from the neighbouring country. And how nice to see the green and red coloured design, while nowadays (almost only?) full colour stamps are issued. Engraved stamps are long gone, I fear. More's the pity! Very nice bi-colored stamp, a classic of days gone by. It is a shame that M Mignon didn't have the opportunity to engrave more stamps. Catching up through the last several sets of stamps. That one had=s a very retro feel. I'm still stuck on the dino eyes, though! I'm with you on those eyes! A great design on such an old stamp.